2008 heat issues vs. newer models.... is my dealer lying? I purchased a used '08 back in April (when it was cooler here in upstate NY and didn't realize the extent of the heat given off by an otherwise very nice bike), and several months later I'm finding the excessive heat given off by this machine quite uncomfortable at times. saying that lots of big bore bikes have this issue, caused largely by legal requirements for emission control etc. Funny thing is, when I mentioned that my BMW K1200rs doesn't have this issue, and nor did my R1200RT or my Hayabusa, he expressed surprise. Looking for honest feedback here. Yeah, it would bother me to have to unload the '08 (paid 8400 for it with 10K miles) and spring for the additional cash, but I need the heat thing to go away......or the bike goes. On a related note, would installing the insulation I've seen mention of largely take care of this issue, or.....? On an unrelated note, I can't believe the left headlight control knob fell off the thing a few days ago. Pretty damn annoying. Re: 2008 heat issues vs. newer models.... is my dealer lying? Some folks find the 08-09 to be warm (such as yourself). The 2010+ models are cooler because of a redesigned fairing. But before you lose a bunch of money on your bike upgrading (debatable). Why not try Zteve's heat blockers for the 08-09. Some folks swear by them, others might not care for them. You can find them in the C14 Farkle directory under heat blockers. I think trying Zteve's heat blockers is a great idea. 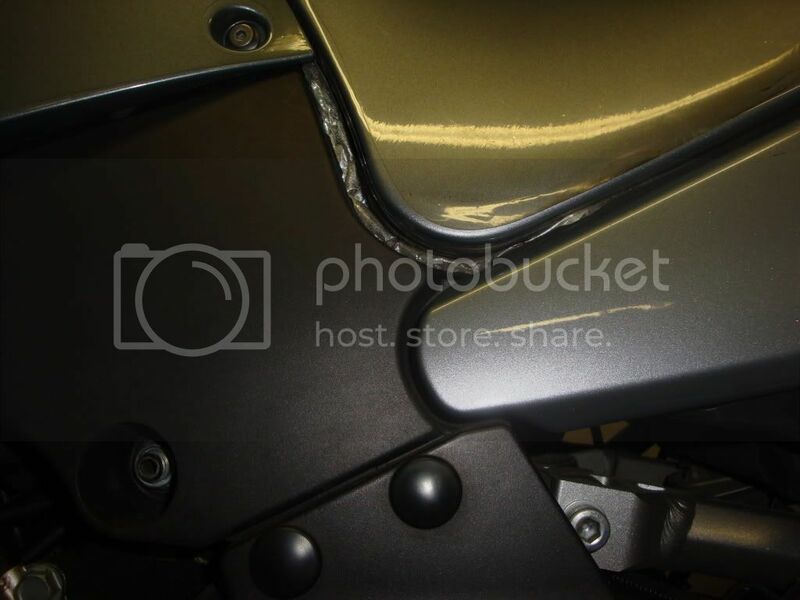 They are basically what the 2010+ bikes have, a nearly vertical wall of plastic, rubber, and foam which seals off the engine / radiator area so the only way the air can go thats coming in the front is out through the side vents. Which is how they wanted it to work to begin with, but engineering didn't think about the heat running inside the fairings and radiating onto the rider's lower legs. At least they fixed it after the got a few thousand complaints. ZSteves panels work great if you spend a lot of time below 45 mph, but at highway speeds having the extra air flow keeps the tank and seat cooler for my knee and thighs. I use my ZSteves around town, but if I am going on a road trip I take them out. They work but there are trade offs. The dealer is not far off, from what I've experienced. My Ninja 1000 has a lot less plastic around the motor, but it still throws its share of hot air. 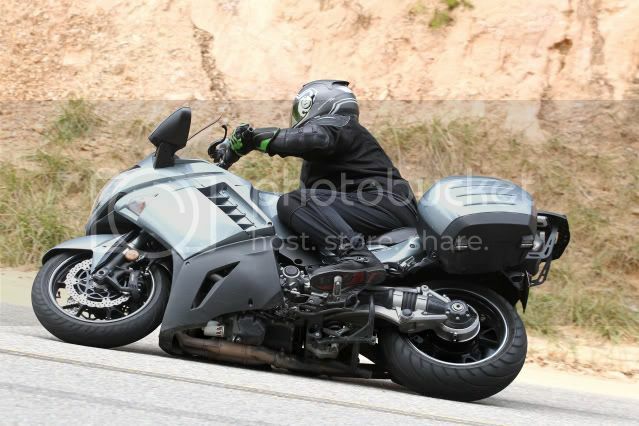 I dont like the tank getting hot on my 08 c14, but its never stopped me from riding. I was getting irritated riding in Southern Utah at 106 degrees, though. Once I climbed off the bike, I realized it was very uncomfortable outside, bike or not. There is a lot you can do to help with the issue. The rubber blocks that mount down low help a great deal as does a piece of insulation under the tank. If you start checking pieces of the bike with an infrared thermometer, its amazing Kawasaki did as well as they did in insulating the rider from the heat. On my ZX14, they did almost nothing to stop the heat, just a couple stiff foam pieces that slid on and were held in place by the cowling pressing against them. That bike would flat cook your feet and ankles. After I ceramic coated Brock's Performance CT-Dual exhaust system the felt heat dropped significantly, because there was less blowing back off the headers. And I purchased some additional baffling which also helped. As she broke in, the felt heat lessened some more, I guess the engine just ran looser / more free or something. When I switched to dual fans and Engine Ice, the felt heat dropped again, which indicates some of the felt heat comes from the radiator. Buy or fabricate some lower blockers then put a sheet of auto sun shield under the tank. Leave the edges long enough to cover the seams into the side panels. These did not affect running temps. and even helped keep the glove box cooler. It's not as noticeable as appears in the photo as the flash highlighted the material. Also cut the stock shield down for summer riding which brings MUCH more air into the cockpit. ZSteve's heat blockers work great for keeping the heat off of your ankles and shins. Be aware though that they will push more heat up around the tank. You'll need to add insulation around the tank like other folks on this thread recommended to totally mitigate the heat. Thanks for this report. I had considered trying these but my shortest day on the bike is 50-100 miles of open roads in IN and OH and the only time it sees 45 is on the way up and down to a stop. THink I will save the money for another farkle. The heat blockers work great. So does adjusting the windshield height. Bikes get hot and you have to wear long pants. I guess peoples heat level is different. Personally I think too many of you have gotten soft in your later years. Get a Can Am and have an air conditioner put on it. I had the same results as Anthony - Sacramento. I'd rather have warm feet than cooked... um.... well.. you know. Cap'n Bob has listed the changes between the Gen I and Gen II C14's. There's far more differences between the 2010+ bikes and the earlier bretheren than just heat blocking. I've got that in mine.... it helps but the panels trapped too much heat into the tank area. Keep in mind I'm in florida so im getting cooked from both sides along with the high humidity. It's really only bad for a few months in the summer. So since I didn't think there was really a heat problem in the first place. I pulled them back out. So when the sun beat down on my thighs, I again could cool them. So mine worked fine. Three cats???? Where are they??? I havent found even one yet! Answer is yes, the dealer was blowing hot air. Before and after I bought my 08, I asked multiple dealers employees about the heat. They go into theatrics about how all bikes this large are hot, how much hotter this and that model are, if you believe them you will expect to need a warm coat when you ride your new connie. That's their job, to blow enough warm smoke up your rear so that money falls out of your wallet. That is pretty much their purpose in life, to 'overcome objections' you have to giving them your money. Thanks, guys, for all the replies. Trusting my instincts, I decided to solve the problem. I traded in my beautiful steel gray '08 yesterday for a brand new, black 2012. Honestly, I don't know how anyone could claim the unwanted heat output is nearly the same and "don't waste your money". Put simply, there's no comparison. While I have yet to use my laser thermometer to measure the surface fairing temperature, I would subjectively estimate the unwanted heat output of the 2012 to be no more than 40% of what I found all but unbearable on the '08. mode. The bike just feels more nimble. 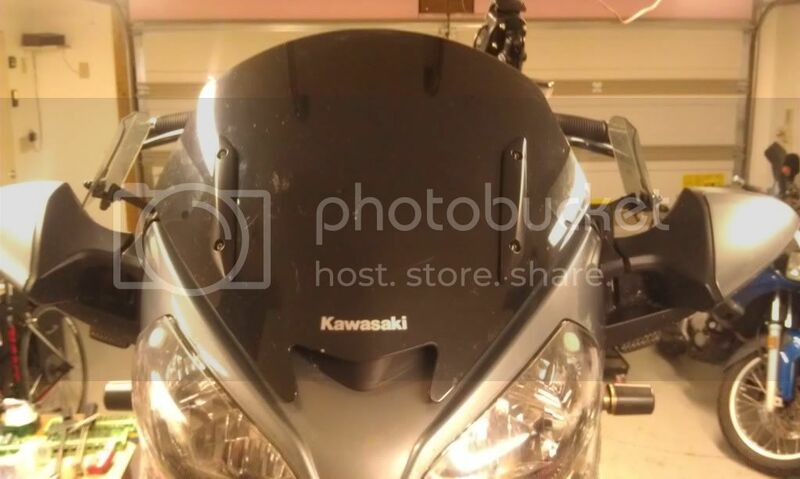 Too bad, though, that Kawi retired the 08-09 gray color. I've had my share of black vehicles, and it's probably the last color to choose in terms of summer heat and big engine power. But heck, I'm looking at the road. The odometer's only got 120 miles on it, but I think this one's a keeper and has put that grin back on my face. I couldn't agree more. I gave up on various issues with the '08 on Saturday, trading it in for a new black 2012! I'm ecstatic and grinning ear to ear.